I owe my parents a world of thanks. They gave me a wonderful childhood, filled with love, security, and encouragement. They taught me and gave me perspective. And they gave me a great foundation for my faith today. But ironically, it's the one thing they did NOT do that I am most thankful for. They did not kill me. Over 42 million children in the world were not so lucky last year. They were killed before they even took their first breath. If that group were a state in the U.S., it would be the largest. If that group were a country it would be the world's 30th most populous ... larger than countries like Canada, Argentina, and Poland. If that group all grew up to be followers of Christ ... imagine how much better our planet would be. God has a plan for all of us. From the minute we are conceived (and probably even before that) to the minute He calls us back. Today, my prayers are for all of those who do not get the chance to accept that plan. And even more so, for those who think their plan is better. Wow! 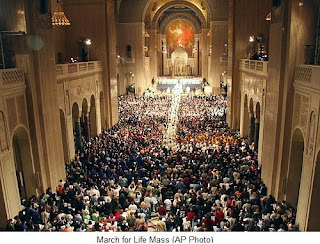 What a wonderful personal way to share the faith and to encourage standing up for life. Simply beautiful and the photo you used is fabulous too! I always look forward to your posts. God bless! Oh how I wish pro abortion women would understand that the life they carry is not theirs to throw into the garbage! Thanks Michael. Your post with its comparisons to the number of children forming a state, country etc really put the matter in correct perspective. What a wonderful tribute to your parents Michael! Life is so very precious. It seems we are so willing to throw it away in our society whether through abortion, war, or now this push for euthanasia. It's very sad. If only people would think before they act. I pray for our world. I pray that people will stand up for what is right. Thank you for calling attention to such an important issue. Blessings to you Michael!